A Halifax branding and marketing company has continued its expansion by adding two new staff to its growing team. 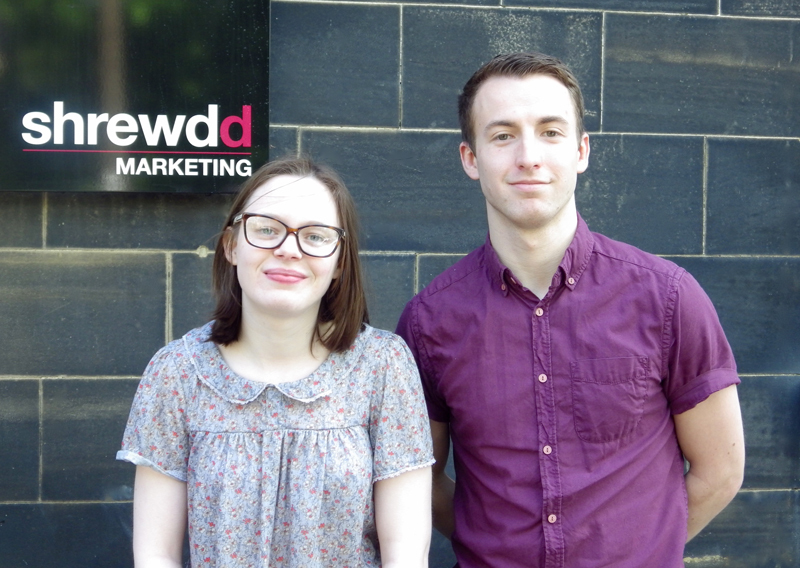 Shrewdd Marketing, based on Harrison Road, has taken on Jared Priestley as account executive and Emily Madigan as a business administration apprentice, increasing its team to 12 people. The new appointments come as the company sets it sights on doubling in size over the course of the next three years. Jared, a graduate from the University of Huddersfield, comes from a background in journalism having worked for The Press newspaper in Batley and League Weekly. Emily was a former Halifax Trinity Academy pupil where she studied A-Levels in Creative Media, IT, Business, and Health and Social Care. Emily also worked for Teamsearch, a telemarketing company, in a telephone interviewer role whilst completing her studies. Shrewdd Marketing provides a full range of services including brand development, public relations and social media. The company works for a number of Yorkshire’s leading companies and has a growing portfolio of customers who are expanding internationally. The recruitment comes on the back of the recent news that Shrewdd secured an international contract with Chicopee, one of the world’s leading brands of specialty cleaning wipes.